They say they don't build 'em like they used to, but this 21-story, red-brick apartment tower surely will give passersby a good double-take for it is probably the closest thing in appearance in decades to the proverbial "pre-war" apartment building. The Italian Renaissance palazzo-style design, moreover, is by Costas Kondylis, one of the city's pre-eminent architects of new and usually glitzy apartment towers. Most such "palazzo"-style buildings, of course, are quite boxy and this does have a couple of setbacks above the 15th floor. It has a two-story stone base, a bandcourse above the fifth floor and the top floors at each setback have stone reveals. The red-brick pilasters between the third and fifth floors and those on the setbacks have stone capitals and bases, a nice touch. The building's entrance also has a large marquee. The building, which opened in 2001, was developed by Sidney Fetner Associates and The Gotham Organization, Inc. The building has 38 apartments with formal dining rooms, eat-in-kitchens, 9-foot-high ceilings, a doorman, high-speed Internet access, and a six-foot whirlpool bath and a washer-dryer unit in each apartment. It has an indoor-outdoor children's playroom and terrace and a 24-hour, residents'-only garage. Many of the apartments have views of the East River. 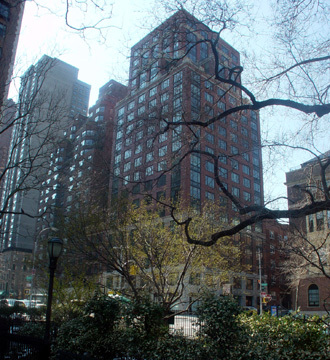 The building has no sidewalk landscaping but Carl Schurz Park is diagonally across the avenue and many prestigious private schools are nearby and a downtown entrance to the FDR Drive is at 79th Street. The building was created with five studio apartments on the second floor that were available to apartment purchasers in the building as maid's rooms and which became the focus of a legal controversy that was written about in the July 2005 issue of The Cooperator The Co-op & Condo Monthly by Hannah Fons, the associate editor of the publication. "Historically, co-op buildings have had the market cornered on board-mandated restrictions, strict bylaws, and procedural red tape, while condos have been more black-and-white: co-op shareholders own shares, and condo owners own real estate. Co-op residents wishing to sell their shares faced the greater possibility of board interference in the sale process than condo owners, whose boards typically exert only the right of first refusal when it comes to who buys into the building....Thanks to a recent court decision, however, that sharp dividing line between co-op and condo may not be quite so sharp - and condo owners may find themselves pondering new powers and the consequences of using them. 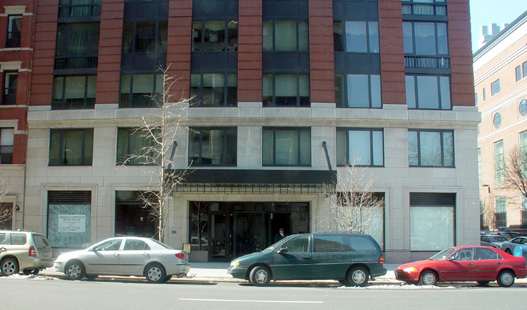 In a surprise decision rendered on May 31, 2005, the Appellate Division, First Department (which covers both Manhattan and the Bronx) ruled unanimously in favor of a Manhattan condo's right to restrict how units within the building can be sold and leased....Questions arose, however, because despite the developer's intention that the five studios be reserved specifically for unit owners, nowhere was that intention laid out as an official rule. There was no specific prohibition against a unit owner with a studio selling or renting out that studio to an outsider - an oversight that one unit owner brought to the board's attention when he wished to sell his studio unit, but keep his multi-bedroom unit. With the demand for studio units far outstripping the building's modest supply, it was no problem finding another unit owner happy to purchase the seller's studio - the seller got rid of his studio, and the buyer gained a much sought-after amenity. But the unofficial nature of the 'studios for residents only' rule prompted the board to present the unit owners with a proposal: to draft a new bylaw specifically stipulating that studio units be sold or leased only to current unit owners....Given the great demand for the studio units, the board's proposed amendment easily passed among unit owners by a super majority - but that wasn't the end of the story. One unit owner - noted real estate developer Jules Demchick, whose JD Carlisle Development Corporation's projects include the ultra-fashionable Morton Square in Greenwich Village and the Penmark luxury rental building in Midtown - objected to the board's move from the start on the grounds that it constituted an 'unreasonable restraint of alienation.' In a nutshell, the concept of restraint of alienation holds that most - though not all - restrictions placed against the transfer or sale of real property are not valid, because they infringe on the fundamental right of an owner to sell, and because there are certain rules against what's called perpetuity. In other words, you can't generally sell someone a piece of property on the condition that, should that purchaser later decide to sell it, they could only sell it to members of a certain family, or of a certain political persuasion....The lower court that heard the case found in favor of Demchick, and ruled that the restriction on sales and leasing of the building's studio apartments was not reasonable. On appeal, however, the tables turned, much to the surprise of many observers. The Appellate Division found that in the interest of preserving 'building character,' a super majority of condo unit owners could indeed vote to include more restrictive bylaws governing sales and leasing of units - and the appeals court overturned the trial court's earlier decision, reversing the ruling for Demchick." Carl Schurz Park is across the avenue and many prestigious private schools are nearby and a downtown entrance to the FDR Drive is at 79th Street.